For the ancient Germanic people, see Thuringii. 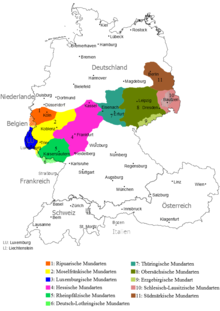 Thuringian emerged during the medieval German Ostsiedlung migration from about 1100, when settlers from Franconia (Main Franconia), Bavaria, Saxony, and Flanders settled in the areas east of the Saale River previously inhabited by Polabian Slavs. The Thuringian dialect is characterized by a rounding of the vowels, the weakening of consonants of Standard German (the lenition of the consonants "p," "t," and "k"), a marked difference in the pronunciation of the "g" sound (which is most common in the areas of North Thuringia and Saxony-Anhalt areas), and a highly-idiosyncratic, melodic intonation of sentences. The second German consonant shift manifested itself in a manner different from that elsewhere in the areas that spoke High German. In many words, "b" is pronounced as "w" or "f" would be in Standard German. For example, the word "aber" (but) is pronounced as "awer". The Thuringian dialect has advanced beyond the stage of basilect. Southeastern Thuringian around Schleiz, Greiz, Saalfeld and Gera, as well as around Ludwigsstadt in neighbouring Bavaria. Western Thuringian, around Bad Salzungen and Eisenach, with transitions into the Main-Franconian (Henneberg) and (East) Hessian dialect area. ^ Hammarström, Harald; Forkel, Robert; Haspelmath, Martin, eds. (2017). "Thuringian". Glottolog 3.0. Jena, Germany: Max Planck Institute for the Science of Human History.